Next month marks the 4 year anniversary of fulfilling a childhood dream of mine, moving to Colorado from my native New Jersey. When I moved, I was no stranger to the costs and rigors of moving, but the long distance move was a whole new experience. If moving can be expensive, it pales in comparison to long distance moving. Luckily, there are a variety of options like those offered by Unigroup relocation services and a frugal person can make their way across country (or countries) without breaking the bank. Not all of these options will work for everyone. If you don’t have a driver’s license or have a medical condition which limits your ability to drive for extended periods, renting equipment and transporting it yourself won’t work and you may have to hire long distance movers. If the place you are leaving or are arriving has limited space, a large truck may not be able to reach it. Consider your circumstances to determine the best option for your long distance move. If you are considering this route, there are some things you need to consider. Most rental places will not rent a trailer to be pulled by a convertible or soft-top. There may be minimum weight requirements as well. Determine the towing capacity of your vehicle. This will be in the owner’s manual and can be found online. Exceeding this weight can damage your transmission. Backing up a trailer is tricky! If you’ve never done it before, don’t try it for your long distance move. All of the major truck rental franchises offer long distance moves. While local rentals charge by the mile, one-way rentals will have a certain number of miles allotted. This allotment will have plenty extra for pit stops and short side trips. In one quote, 15% extra mileage was allowed over the actual trip distance. If you have a vehicle to transport as well, you can get one of those multifunctional aluminum folding ramps to load your vehicle into the truck bed or rent a car dolly to pull with the truck. The option I used in my move was LTL moving services. LTL stands for “less than load” and refers to a partial load in a tractor-trailer. When shipping via LTL, you pay per linear foot of trailer space used. If you use 5 feet of trailer space, you pay for 5 feet of trailer space. Since a semi trailer is larger inside than a moving truck, less linear space is needed. A 17 foot moving truck is equivalent to 12 linear feet of a semi. The remainder of the trailer space is used for commercial loads. Your stuff will take longer to reach the destination as it will make multiple stops to load and unload other LTL loads along the way. While the LTL option will seem more expensive than renting a truck for a long distance move, the costs are pretty competitive when tolls and the cost of fuel for a rental truck (expect roughly 8 mpg for highway driving) are considered. What can be another way to save when using an LTL moving company is to load and unload at their terminal. I rented a truck to deliver my stuff to their terminal and rented another to pick it up from the destination terminal. The total cost of 2 local moving truck rentals and the long distance move was almost $300 less than what driving a rental truck across country would have cost. The terminal-to-terminal option is also going to be necessary if one or both ends of your trip have limited space or no parking available for a 28 foot trailer. You can also mix-and-match between door-to-door service and terminal-to-terminal, by loading at the terminal and having it delivered to your destination, or loading at your departure point and unloading at their local terminal on the other end. PODS created the concept of the storage container, but now most moving companies also offer this company. Most storage containers are a little bit smaller than the inside of a small moving truck, but sizes as large as a medium-size moving truck exist. Like an LTL mover, a storage container (or multiple ones) is delivered by truck at your home for you to load. When you are done, you call for pickup and it is delivered to your destination. Unlike an LTL mover, you can set the date for delivery (although time for transportation is needed). The added bonus of a storage container is that they are ground level so there are no ramps to be climbing. The downside of storage containers is they tend to be pricier than the other options. While still cheaper than a full-service moving company, there is a premium for the convenience. PODS insists they are cheaper than renting a moving truck, but my own analysis has failed to reach that same conclusion. Including the cost of gas and tolls for a rental truck, storage containers tend to cost $100-$300 more for a cross country move. Of course, you then need to transport yourself as well! This one is a bit different. If you don’t have an emotional attachment to your furniture, you may find it cheaper to start over. Simply sell your old furniture before you move and buy new (or better- used) when you reach your new home. Furniture will be the heaviest and bulkiest part of your possessions, so not packing and moving it will mean less time loading and unloading and less space required. And less space means a smaller truck/container can be used, saving more money. By understanding your personal strengths and weaknesses, you can select the best option for a long distance move and save hundreds of dollars over a full service mover. Have you ever had a long distance move? Did you pick a self-moving option like one of these, hire movers, or did you do something else? Author Bio: Edward Antrobus is a construction worker, blogger, tinkerer and a househusband. He writes about frugality and occasionally rants about what he thinks the personal finance community gets wrong. Great tips Edward! I HATE moving and moving long distance is worse. When we moved from San Diego to Omaha we used a service similar to LTL. We paid by the foot and the nice thing is that they drive the van so we did not have to worry about driving that beast. If I ever wind up moving cross-country again, I will probably go that route again. It was great driving out here and not having to worry about finding a parking spot for the truck. I have had a pretty traumatic move from Spain to the UK where the moving company broke and lost my things, so when I moved UK-Morocco I drove there and now to Guatemala I took just what was in my suitcase. The more moves, the less you need, and considering the costs, it is usually cheaper to sell as much as possible and start over. This last move was the first time we didn’t get rid of a sofa during a move. Moving is always so much work! Hopefully I wont be moving for a while. Great tips on renting a trailer though, I bet that saves a ton of money. A trailer is great for moves without a lot of stuff, but furniture furniture fill it up pretty quick. We moved to Colorado too, Edward, but in 1984, from Michigan. (Ann Arbor) Thanks to a downstairs apartment-dweller who had the world’s largest collection of unrinsed pop bottles, we had a healthy population of cockroaches hidden in our stuff. We packed it all in a closed trailer, then fumigated the thing. Solved the problem. We rented a truck, stuffed as much as we could in, donated or sold the rest, and drove — all in one long haul. We did the same thing, when taking things from Husband’s mom’s estate in Missouri. But for the next move — I think I’d prefer just getting rid of as much as possible beforehand. We don’t really have many things that are financially of that much value, besides my quilt collection (used to teach with) and a few family heirlooms. It could all go away, and I wouldn’t be that upset…a lesson learned when our downstairs basement flooded, and we lost nearly everything stored there. Once it’s gone, it’s really not that important. I was offered a job in Lansing once but that would have been long after you arrived in Colorado. If you can get replacement furniture cheaply, I really think that ditching it before a move is the way to go. Renting a trailer is a great option, as long as you’re careful with the driving. A friend of mine wasn’t used to the size and got into a minor accident. Ouch! Pulling at trailer isn’t as easy as it looks. I moved from the UK to Canada and sold off almost everything I owned except for about 10 large boxes. I had them shipped over in a container which wasn’t that expensive. I am however glad I got rid of what I could have easily bought here for cheaper than shipping from the UK. It’s smart to plan a move, long distance or short. You are right backing a trailer up does take skill. I couldn’t imagine shipping furniture over seas. And failing to plan is planning to fail! 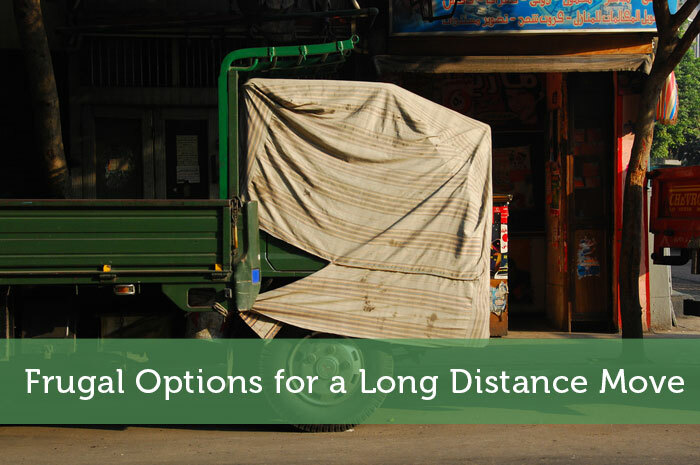 Those are some good options for long distance moving. I would probably end up going with renting a truck. I couldn’t rent a trailer because my car would not have enough power to haul it across the country. The only time I’ve moved across the country was right after college. I didn’t have much and not everything was that valuable honestly, so I just stuffed as much as I could into my car and gave away as much as I could of the rest. I still have some things at my parents though! Slowly dwindling items down. It wasn’t cross-country, but I did the pack the car up to the could for a move. A space just large enough for my arm to reach the shifter and a printer on my lap! With several international moves under my belt I have to agree with Canadian Budget Binder – there are few things that are really worth shipping, really just items of sentimental value. However, those few favourite things will feel incredibly important after a few years in your adopted country – a reminder of home! I wonder where the break-even point is on an overseas move. Furniture is obviously cheaper to replace. But what about kitchen-wares or clothing? I could probably got every article of clothing I own in 2 wardrobe boxes, do I would assume that at least would be cheaper to bring with you. I’ve moved a lot in my life and have used several systems. I’ve had relatives mail me stuff. I’ve started over from scratch. I’ve rented a truck. And I’ve even had professionals move me (not frugal, but so so much easier than any of the rest). Other than hiring professionals I’m a fan of starting over from scratch. It’s nice to buy new furniture that you know will fit your new place, but it can take a while to get everything set up. Since I’ve never been in a position to buy really nice stuff, it’s not like I was losing a lot of money. I’m not really a fan of renting a truck because I’m not comfortable driving them. I can do it, but I’d prefer not to. I hear you about driving a rental truck. Truck driving is kind of in my blood, but I greatly prefer small vehicles. Even mid-size is too big for me for general usage. Moving is always difficult no matter the distance, but it’s a lot easier to move things when it’s near because you don’t to haul everything all at once, but what really annoys me is when some of my stuff get damaged in transit, so I think it’s a lot easier to just sell those stuff that do not have any sentimental value and start over. I hate breakage. After trouble in a previous move, or most fragile items were wrapped in bubble wrap, newspaper and clothing and then all sides of the box were marked extremely fragile so everybody knew not to take any chances with those boxes. We are moving from Grenada to Louisiana in December, then from Louisiana to New York in April, so I will definitely be bookmarking this one! Thanks! Glad I could help you. I hate multiple moves like that. I’ve done it three times now. Moving is most definitely daunting task; however, taking a few of these tips and instituting them as part of your moving plan will help your move go more smoothly and efficiently than it might otherwise. Good luck! Fantastic info here! The LTL option is GREAT if you have the time to spare, and selling can also be a super smart option specifically for overseas moves. I’m still not exactly sure what route we’ll be taking. I thought maybe the pods. Our move is from New Hampshire to Houston, TX. The biggest problem for us is that we have three cats and a dog as well. Still trying to figure out what the best option for us is. We’re definitely selling our big furniture like our couch and bed and a huge coffee table. Hopefully that helps cut costs for us. I actually have a lot of experience with long distance moves and I would like to add that it depends on where you would be moving to. If the area is pretty rural, you might want to consider options of moving your furniture with you. To buy new furniture for your new place would most likely require you to pick it up from outside your area. If you don’t own a truck things become even more complicated and you would have to rent a trailer again, which would just waste your time and money. To avoid the stress that comes with moving, you should hire competent movers who will provide you with great services that will help you to get situated faster and stress-free. I like the valuable information you provide for hire a moving company. I’m trying to coming up with a way to get my stuff moved to my new home. It makes sense that I would want to get rent a trailer! That seems like a nice and cost effective way to get everything moved.